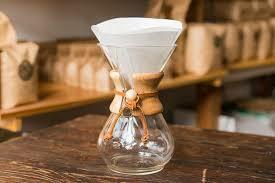 The Chemex Coffeemaker was invented in 1941 by Dr. Peter Schlumbohm PhD. Made simply from non-porous, borosilicate glass and fastened with a wood collar and tie, it brews coffee without imparting any flavors of its own. Grind coffee to medium coarse. Open a Chemex Bonded Coffee Filter into a cone shape so that one side of the cone has three layers, and place it into the top of the Chemex brewer. The thick (three-layer) portion should cover the pouring spout. Put one rounded tablespoon of ground coffee for every 5 oz. cup into the filter cone. Feel free to use more if you prefer it stronger; our Chemex brewing process eliminates bitterness. Once you have brought the appropriate amount of water to a boil, remove it from the heat and allow it to stop boiling vigorously. Pour a small amount of water over the coffee grounds to wet them, and wait for about 30 seconds for them to “bloom”, releasing the most desirable coffee elements from the grounds. After the grounds bloom, slowly pour additional water over the grounds while keeping the water level well below the top of the Chemex (quarter inch or more). If using a gooseneck kettle, slowly circulate the pour to stir the grounds. An optional step is to stir the grounds with a wooden spoon or paddle. Pour your freshly made coffee into your Chemex mug and indulge in the flavor. A carefully cleaned and handled Chemex brewer will give you a lifetime of service. Remove the wooden handle and continue to hand wash with warm soap and water, or place the coffeemaker securely in the dishwasher.